Andy: Wow…this is one REALLY sweet rum! It tastes like a melted cherry Icee. Tastes like a Cherry Coke when mixed with Diet Coke. 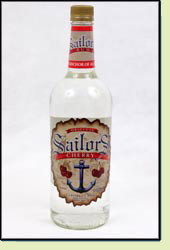 This is the only cherry rum I have seen on the market to date..give it a shot if you are a cherry fan…it’s good! Adrian: Sailors Cherry is very sweet and really tastes like cherry. It is so smooth that you can’t even tell you’re drinking rum. It tastes like candy or a melted cherry life saver. Even if you aren’t a rum drinker…mix it with some Coke Zero for a tasty Cherry Coke. Saw this was posted this year, but I’ve been a huge fan of this rum for awhile and heard the distiller went out of business and haven’t seen it in ages. Where’d you end up grabbing it from? I would buy it all. ALL, I tell you. Thanks! We just did a tech refresh on the website which resulted in the dates changing for old entries. Good question on if Sailors is still around. Definitely good stuff!